Every year I write a letter to you about my mother and every mother out there. This year I have decided to keep it short because I want you to focus on what your mother means to you or what the mother figure in your life means to you! It is important to thank the women in our lives who have supported us, shared memories of happiness with us and shared times that weren’t so great with us. I can honestly say as a mother it is one of the most challenging, educating, and best experiences I have ever had. Watching my children grow into young adults and seeing them make choices for themselves has been scary, but very rewarding. I raised them to be strong and hardworking people. They used to hate it when I gave them advise and now they come to me and say your remember when you said x, y, and z?… Well you were right! The title of mother is one I proudly wear and I keep it polished! Please take the time this year to be with your mothers, or remeber them and how they are still with you every day! 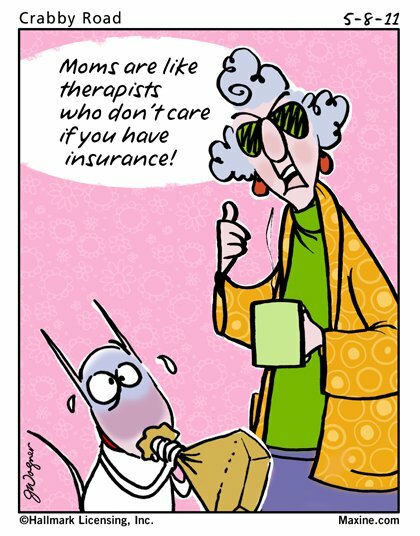 I leave you with a cartoon of my favorite funny woman, Maxine.